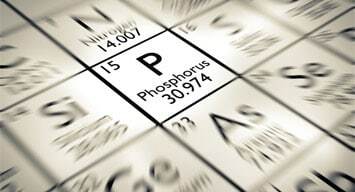 Phosphorus is an essential element which is contained in many cellular compounds, such as DNA and the energy carrier ATP. All life needs phosphorus and agricultural yields are improved when phosphorus is added to growing plants and the diet of livestock. Consequently, it is used globally as a fertiliser – and plays an important role in meeting the world’s food requirements. In order for us to add it, however, we first need to extract it from a concentrated form – and the supply comes almost exclusively from phosphate mines in Morocco (with far smaller quantities coming from China, the US, Jordan and South Africa). Within Morocco, most of the mines are in Western Sahara, a former Spanish colony which was annexed by Morocco in 1975. The fact that more than 70% of the global supply comes from this single location is problematic, especially as scientists are warning that we are approaching “peak phosphorous”, the point at which demand begins to outstrip supply and intensive agriculture cannot continue to provide current yields. In the worst case scenario, mineable reserves could be exhausted within as little as 35 years. So what is going on – and how worried should be? But this applied inorganic phosphate fertiliser is highly mobile and leaches into watercourses. In addition, phosphate rock weathers and is also ultimately washed into the ocean where it either deposits as calcium phosphate or is taken up by marine organisms who also eventually deposit on the ocean floor when they die. Consequently, terrestrial phosphorous doesn’t really disappear, but it can move beyond our reach. To complicate matters further, even the phosphorous we can use is largely wasted. Of the phosphorus mined as fertiliser, only a fifth reaches the food we eat. Some leaches away and some is bound to calcium and iron in the soil. Some plant roots have the ability to extract the latter, but not in large enough quantities to retrieve all of it. In addition to these inorganic forms, phosphate is also converted into cellular compounds, creating organically-bound phosphorus, such as phospholipids or phytate. After the death of an organism, these organic phosphorus compounds need to be returned into the useable phosphate form. How much organically-bound phosphorus is present in soils depends on the number and activity of the organisms that can do this. Peak phosphorus does not mean that phosphorus will disappear, rather that the reserves with mineable high concentrations are depleting. Instead, we are increasing the background concentrations of phosphorus and adding it to the ocean floor. More sustainable phosphorus use requires a greater appreciation and understanding of the many organisms that make up soils – and the part they play in phosphorus distribution – or we may no longer be able to feed the world at an affordable price. The Conversation, authored Vera Thoss, Lecturer in Chemistry, Bangor University, Wales.